The above engraving by Casper Luyken (1672-1708) illustrated a map, one of a series of Theatre of War maps for the War of the Spanish Succession, 1701-1714. Much of that war took place in lands lived in by our ancestors in years preceding the emigration of our ancestors. The original of the engraving can be found in the Amsterdams Historisch Museum. 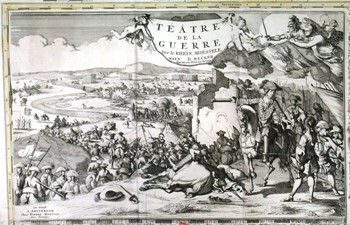 The map is Teatre de la Guerre Sur le Rhein, Moessele, Mayn, Le Necker. It is a large wall map of Western Germany with rivers Rhine, Main, Mosel and Neckar, and the eastern part of France (Lorraine, Alsace and river Meuse) with two very large pictorial title cartouches showing military action.. From the plate by Nicolas Sanson published by Pierre Mortier ca. 1707  95 x 115 cm. From the private collection of a European aristocratic family. Illustration reproduced here with the kind permission of GARWOOD & VOIGT, Fine & Rare Books Maps & Prints, 55 Bayham Road, Sevenoaks TN13 3XE England, Tel: +44-1732-460025, Fax: +44-1732-460026, www.garwood-voigt.com. ermans had begun to leave Germany – which was at that time merely regions composed of principalities – in 1683, but the flow began to increase in about 1709. The first Germans settled in eastern Pennsylvania, and although Queen Anne settled some Germans in New York State, Pennsylvania was the popular destination after William Penn began to recruit among Protestants in Germany and promised religious tolerance in Pennsylvania. The earlier German emigrants tended to be Anabaptists, or pietists—the forerunners of today’s Amish, Mennonites, Moravians, and the like. Many of them had been banished from Switzerland in the 17th century because of their religious beliefs, and had settled in Germany. But they began to be joined by others of the less extreme Protestant denominations: German Reform and Lutherans. Historians and genealogists give a variety of reasons for the exodus from Germany. Religious persecution was part of it. The 16th and 17th centuries in Germany, indeed in most of Europe, were taken up by religious wars. The small principalities of Germany were especially subject to being taken and retaken, or the princes changed religions, and the 30 Years War was fought by the French on the Palatinate lands. If you were the wrong religion in the area in which you lived, perhaps you would not be banished, but you might be required to house soldiers, pay extra taxes, and the like. In the Palatinate, there was a Catholic prince at the time the Yagers left. The wars of Louis XIV of France in particular would have bedeviled our ancestors in the late 17th and early 18th centuries. French armies moved through the Palatinate and other lands of Southern Germany, destroyed Heidelberg in 1689 and again in 1693, and conducted the War of the Spanish Succession along the Rhine between 1701 and 1714, endangering families and crops and bringing hardship to all. Economic conditions may have been even more important, at least for the non-Anabaptist Germans. In some areas, common grazing lands were being enclosed by nobles for their own use, making it harder year-by-year for a farmer to earn a living. In addition, seasons of unusually cold weather had led to famine in Germany. Another problem was that under the German system, land was divided among the sons of a family until they were too small to support a family. Taxes were increased so that the noblemen could build lavish palaces, emulating Versailles. Meanwhile, reports began to come from America from early immigrants of the wonders of the New World. Recruiters seeking settlers in the colony began to circulate down the Rhine, including William Penn. Furthermore, Germans were on the throne of England and they were partial to settling Germans in the colonies. 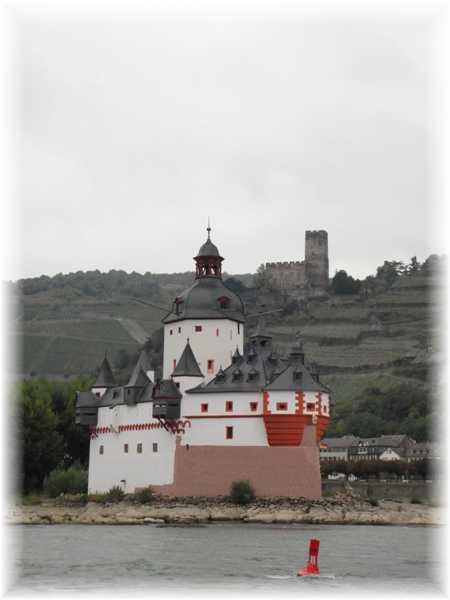 Pfalz Castle on the Rhine would have been one of several toll stops as the Yagers proceeded down river towards Holland. The trip to the New World was difficult and expensive. First, there might be permission to seek from the local rulers, and emigration taxes to pay, although it might be easier for serfs to get permission to leave since they were paying the least taxes. Then there would be the journey down the Rhine River to the Netherlands. Different sections of the Rhine were subject to rights of princes and landowners. There were tolls and fees to be paid many times over before the emigrants were to arrive in Rotterdam. One emigrant wrote that there were 36 such stops before reaching Holland. The authorities in Holland regulated the Germans at their border and there would be more procedures and fees. At Rotterdam, there were ships to be found, more fees to be paid to go to London. In London, again, there would be ships to be found, fees to be paid, stores to be gathered. Germans came to London and lived, some say, in tent cities waiting for ships. The trip across the Atlantic could take months. Some would die. We do not know precisely when the Yagers left home, but other families who would be traveling to the New World with the Yagers, the Weavers and the Clores, left Gemmingen, in what is now Baden-Wurttemburg, Germany, on 12 July 1717, according to church records from Gemmingen.1 These families – eventually to be the Second Colony of Germanna -- possibly all met one another when securing their first river passages down the Rhine, although it could have been later in Rotterdam. One family, later to be close to the Yagers, was the Willhoit family. We believe that the Willhoits left their home in Schwaigern with the other families who would travel together, but then it seems that the Willhoits were forced to stop in the city of Mainz for about two years, not joining the other families in America until 1719. It is certainly a possibility that somehow the Yagers replaced the Willhoits in the group, as it would have been logical for the Yagers to travel to Mainz to find a river boat. According to letters written much later, once in London, the group hired a ship, the Scott, out of Glasgow, captained by Andrew Tarbett. But Tarbett had gambled away the passage money and in London was detained for gambling debts for two months. The Germans were forced to wait throughout the autumn in London, where they attended a German Lutheran Church in London. They would have had to eat their stored food. Later correspondence states that “papers” reported their plight, although no account has yet been found. Captain Tarbett, however, must have heard that the Governor of Virginia, Alexander Spotswood, was looking for immigrants to help settle his lands on what was then the Virginia frontier, near a fort now called Germanna. He conceived of a plan to deliver the Germans to Virginia, not to Pennsylvania, where they had expected to go. Their ship sailed from England after September 8, 1717, which under the modern calendar would be September 19, 1717. The names of the families travelling with the Yagers were: Ambergey, Bellenger, Barlow, Blankenbaker, Broyles, Cook, Clore, Crigler, Fleishman, Harnsberger, Holt, Kaifer, Kerker, Long or Lang, Milcher, Motz, Moyers, Paulitz, Schlucter, Scheibley, Smith, Snyder, Utz, Weaver, and Zimmerman. Almost all of these families were from the Kraichgau region of what is now Baden-Wurttemburg, Germany, near Heidelberg. Some families were from the same villages. The Clores, Weavers and Smiths were from Gemmingen. The Wilhoits, Cooks, Baumgardners and Leatherers were from Schwaigern. The Blankenbakers, Thomases, Fleishmans and Scheibleys were from Neuenberg. But there were no other families from Falkenstein or Oberzell. One imagines, therefore, that our Yager ancestors probably met the other families in Mainz or Rotterdam and decided to join them, and that it was serendipity that their lives, for the next 150 years, would be joined to this particular group of people. 1. Presentation, John Blankenbaker, 50th Anniversary of the Germanna Foundation, 2006 Annual Reunion. "Susanna (Klar) Clore"